Caruso & Minini is a winery located in Marsala, the most western coastal city of Sicilia, where Marsala wines are produced. While the city's natives sometimes drink "vintage" Marsala, the wine produced for export is universally a fortified wine similar to Port. Originally, Marsala wine was fortified with alcohol to ensure that it would last long ocean voyages, but this tradition survived and continued because of its popularity in foreign markets. Traditional Marsala is mainly produced using the Grillo, Inzolia, and Catarratto white grape varietals, among others. Slightly off dry or very sweet, Marsala wines were traditionally served as an aperitif or as a break between the first and second courses of a meal, but have also been used in cooking. They are also great with cheeses and chocolate, and make a great digestif too. However, non-fortified still wines also exist in the region of Marsala and are produced with the same grape varieties: Grillo, Inzolia, and Catarratto (among others). By law it can’t be sold bearing the name of Marsala, therefore the non-fortified wines are sold under I.G.T (Indicazione Geografica Tipica). This appellation denotes wines from a more specific region within Italy, which are considered to be of higher quality than simple table wines, but do not conform to the strict wine laws applied in their region of origin. As an example, before the IGT was created in 1992, "Super Tuscan" wines such as Tignanello and Sassicaia were labeled “Vino da Tavola”. Caruso & Minini is a fairly new project with roots going back more than 100 years ago. Stefano Caruso dreamed it, following into the step of his father Nino, who since the mid 1900s led the family company that was established by his own father, Francesco, and before that, his grandfather, Antonio. The land chosen by Antonino and his son Francesco turned out to be perfect for the production of high quality grapes particularly desirable to Marsala’s wine establishments. The son of Francesco, Nino, discovered the contribution that the type of soil, altitude and distance from the sea could give to the quality of the grapes produced. However, it wasn’t until the deal with Mario Minini was sealed that Stefano and Nino decided to launch the project of building the winery. Minini brought over 80 years of experience and maturity in managing and developing the Brescian winery, a determination to achieve the common objective with Caruso: produce wines that can charm and surprise the palate for their originality, character and elegance. Today, Stefano Caruso leads Terre di Giumara, along with his brothers Francesco and Roberto, and decided to use the name of the family estate for the line of the Caruso & Minini’s single variety of wine. This is a tribute to the work that four generations of vintners have done to improve the quality of the grapes produced. They possesses a great website (www.carusoeminini.it) that I will recommend you to visit for more info about this high quality oriented winery. Caruso & Minini now produces a large portfolio of wines divided in 4 different lines: Le Selezioni, Cusora, Tasàri and Terre di Giumara. 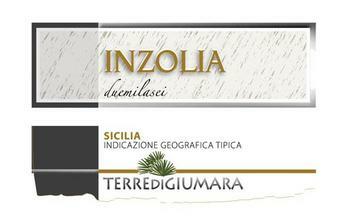 “Terre di Giumara” line focus mainly on single varietal wines: Grecanico, Nero d’Avola and Inzolia. Terre di Giumara is the name of their country estate and the name to their single variety of wines. It renews year after year the indissoluble bond between extraordinary grapes and their unique soil. The hills of Giumarella, located at 15km east of Marsala, seem to be naturally suitable to the production of extraordinary and unique white grapes. Inzolia, which is characterized by intense and elegant fragrances, is a result of an ancient equilibrium between the strong and generous soil and the vine that thrive in this region. Behind its pale yellow color with slight green reflects, this Inzolia is bright, lush, fruity and textured with characteristic nutty aromas and fresh notes of citrus and herbs. Slight touches of sea breeze aromas gently transport you to the coast of Sicily. Fairly rich and balanced, enhancing acidity and minerality (even a touch of saltiness... read my previous post on salty wines) bring some complexity to this uncomplicated and gentle white wine. Enjoy with Mediterranean-style fresh fish, seafood or chicken prepared.